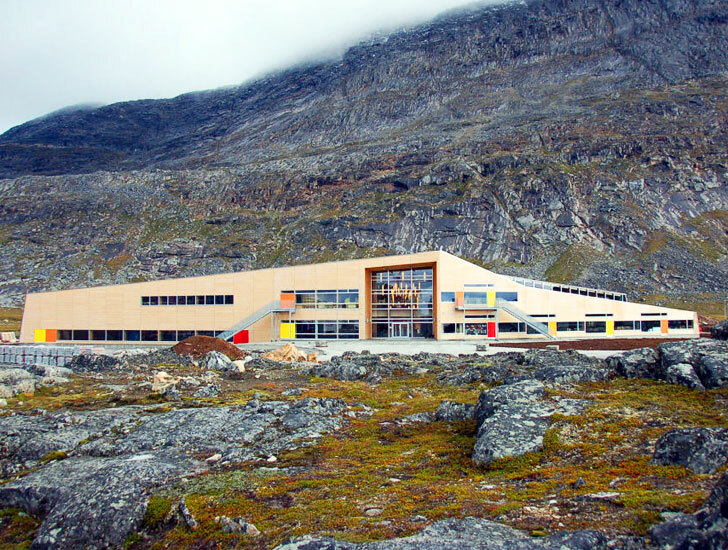 The Atuarfik Hans Lynge School is a stunning new building in the town of Qinngorport in Nuuk, Greenland designed by Danish firm KHR Arkitektur A/S. The 19,685 square foot, $22.2 million structure is not only beautifully integrated into its mountainous backdrop, but it is also designed to withstand some of the harshest climate conditions in the world. Due to the unique topography of the mountains, the school building is particularly vulnerable to strong winds, snowstorms and rushes of melting water. Large eaves protect the building from strong winds, and a long stone gutter captures the melting ice as the weather warms. Carefully angled roofs are designed to carry winds up and over the building, shielding its glass facade from violent gusts. KHR Arkiteckture used wood extensively for the project to reflect the school’s rugged setting. The architecture firm partnered with Troldtekt, a company that manufactures acoustic panels, for the interior of the building. Troldtekt’s acoustic panels are made with 100% natural wood fibers mixed with cement. The architects also incorporated large expanses of window walls to draw in natural light, which is so important during Greenland’s dark winters. High ceilings at the entrances maintain a light and airy feeling inside the school. Another way KHR Arkitecture tackled the gray skies that are so prominent in that region is by using blocks of color throughout the school – reds, yellows and oranges – to warm up an otherwise neutral and cold background. Due to the unique topography of the mountains, the school building is particularly vulnerable to strong winds, snowstorms and rushes of melting water. Large eaves protect the building from strong winds, and a long stone gutter captures the melting ice as the weather warms. Carefully angled roofs are designed to carry winds up and over the building, shielding its glass facade from violent gusts. The architects also incorporated large expanses of window walls to draw in natural light, which is so important during Greenland's dark winters. 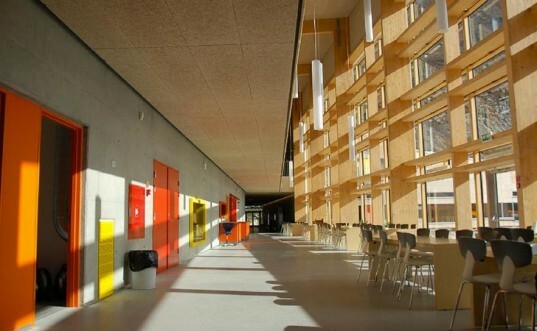 High ceilings at the entrances maintain a light and airy feeling inside the school.